About the end of this year we find Coverdale again abroad on the business of a new edition of the Bible, on which occasion an event happened which shewed the vigilance and jealousy of the Romanists with respect to vernacular translations. 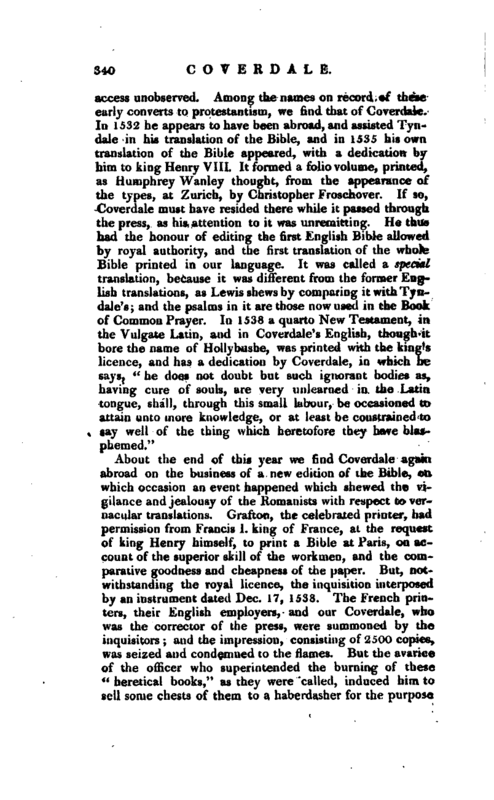 Grafton, the celebrated pri liter, had permission from Francis I. king of France, at the request of king Henry himself, to print a Bible at Paris, on account of the superior skill of the workmen, and the comparative goodness and cheapness of the paper. But, notwithstanding the royal licence, the inquisition interposed by an instrument dated Dec. 17, 1538. The Frenchprinters, their English employers, and our Coverdale, who was the corrector of the press, were summoned by the inquisitors; and the impression, consisting of 2500 copies, was seized and condemned-to the flames. But the avarice of the officer who superintended the burning of these “heretical books,” as they were called, induced him to sell some chests of them to a haberdasher for the purpose | of wrapping his wares, and thus some copies were preserved. The English proprietors, who fled at the alarm, returned to Paris when it-subsided; and not only recovered some of those copies which had escaped the fire, but brought with them to London the presses, types, and printers. 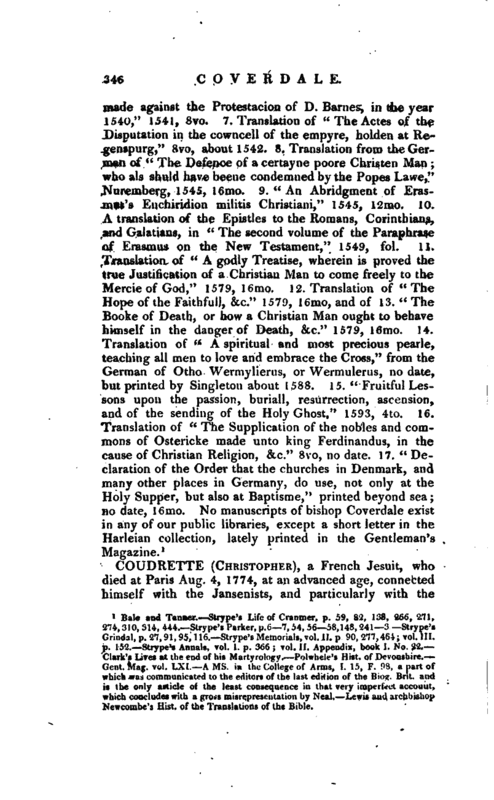 This valuable importation enabled Grafton and Whitchurch to print in 1539, what is called Cranmer’s, or the “Great Bible,” in which Coverdale compared the translation with the Hebrew, corrected it in many places, and was the chief overseer of the work. 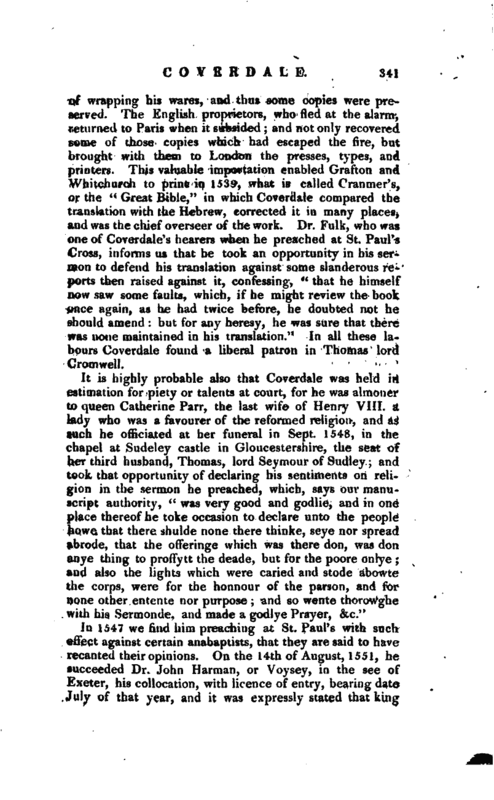 Dr. Fulk, who was one of Coverdale’s hearers when he preached at St. Paul’s Cross, informs us that he took an opportunity in his sermon to defend his translation against some slanderous reports then raised against it, confessing-, “that he himself now saw some faults, which, if he might review the book once again, as he had twice before, he doubted not he should amend: but for any heresy, he was sure that there was none maintained in his translation.” In all these labours Coverdale found a liberal patron in Thomas lord Cromwell. In 1547 we find him preaching at St. Paul’s with such effect against certain anabaptists, that they are said to have recanted their opinions. 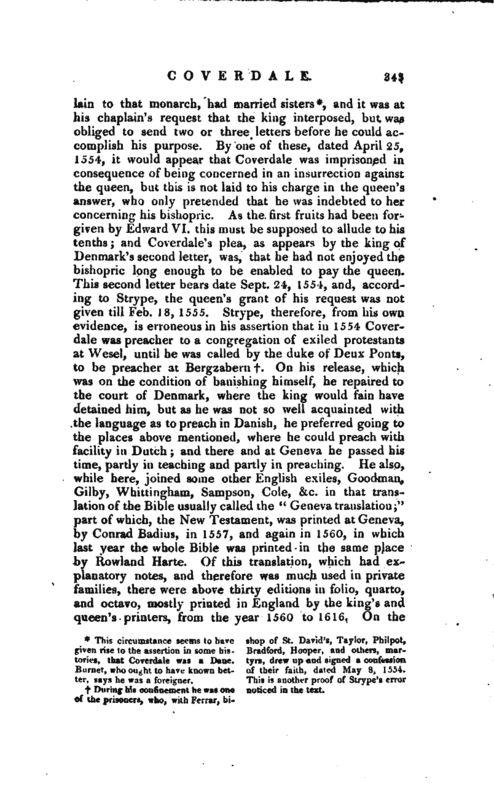 On the 14th of August, 1551, he succeeded Dr. John Harman, or Voysey, in the see of Exeter, his collocation, with licence of entry, bearing date July of that year, and it was expressly stated that king | Edward VI. had promoted him “on account of his extraordinary knowledge in divinity, and his unblemished character.” When lord Russel was sent down to quell the rebellion in the West of England in 1549, he was attended by Coverdale to preach among them, and it was probably the influence of his preaching in composing the religious differences in that quarter, which pointed him out as a fit person to succeed Hartnan, a bigotted papist, who seldom resided, and took little care of his diocese, and to whom, some time before, Coverdale had been appointed coadjutor, an office not uncommon in those days. 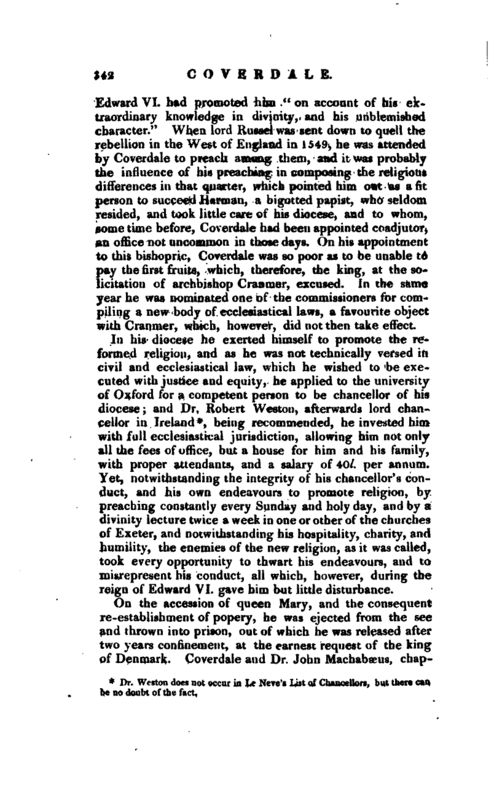 On his appointment to this bishopric, Coverdale was so poor as to be unable to pay the first fruits, which, therefore, the king, at the solicitation of archbishop Cranmer, excused. In the same year he was nominated one of the commissioners for compiling a new body of ecclesiastical laws, a favourite object with Cranmer, which, however, did not then take effect. In his diocese he exerted himself to promote the reformed religion, and as he was not technically versed in civil and ecclesiastical law, which he wished to be executed with justice and equity, he applied to the university of Oxford for a competent person to be chancellor of his diocese; and Dr. Robert Weston, afterwards lord chancellor in Ireland*, being recommended, he invested him ivith full ecclesiastical jurisdiction, allowing him not only all the fees of office, but a house for him and his family, with proper attendants, and a salary of 40l. per annum. Yet, notwithstanding the integrity of his chancellor’s conduct, and his own endeavours to promote religion, by preaching constantly every Sunday and holy day, and by a divinity lecture twice a week in one or other of the churches of Exeter, and notwithstanding his hospitality, charity, and humility, the enemies of the new religion, as it was called, took every opportunity to thwart his endeavours, and to misrepresent his conduct, all which, however, during the reign of Edward VI. gave him but little disturbance. During his confinement he was one of the prisoners, who, with Ferrar, bi shop of St. David’s, Taylor, Philpot, Bradford, Hooper, and others, martyrs, drew up and signed a confession of their faith, dated May 8, 1554. This is another proof of —Strype’s error noticed in the text. This circumstance seems to have given rise io the assertion in some histories, that Coverdale was a Dane. Bui-net, who ought to have known better, says he was a foreigner. | accession of queen Elizabeth, he returned from his exile, but, unfortunately for the church, had imbibed the principles of the Geneva reformers, as far as respected the ecclesiastical habits and ceremonies. In 1559, however, we find him taking his turn as preacher at St. Paul’s Cross, and he assisted also at the consecration of archbishop Parker, in which ceremony, although he performed the functions of a bishop, he wore only a long black cloth gown. This avowed non-compliance with the habits and ceremonies prevented his resuming his bishopric, or any preferment being for some time offered to him. 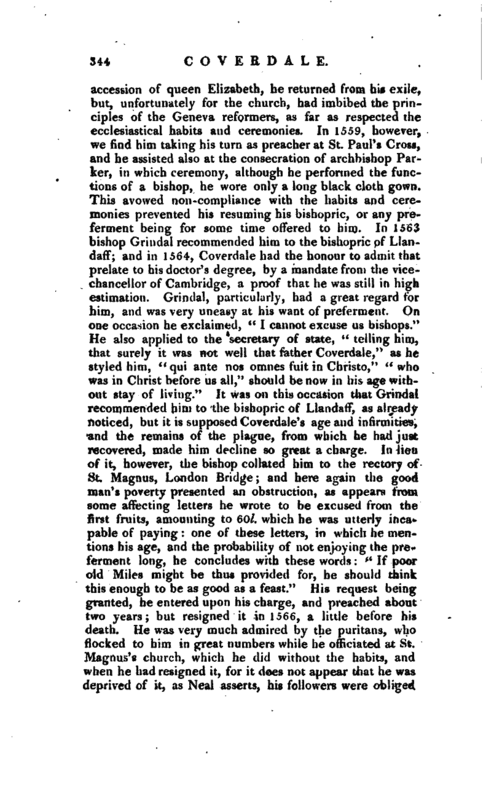 In 1563 bishop Grindal recommended him to the bishopric of Llandaff; and in 1564, Coverdale had the honour to admit that prelate to his doctor’s degree, by a mandate from the vicechancellor of Cambridge, a proof that he was still in high estimation. Grindal, particularly, had a great regard for him, and was very uneasy at his want of preferment. On one occasion he exclaimed, “I cannot excuse us bishops.” He also applied to the secretary of state, “telling him, that surely it was not well that father Coverdale,” as he styled him, “qui ante nos omnes fuit in Christo,” “who was in Christ before us all,” should be now in his age without stay of living.“It was on this occasion that Grindal recommended him to the bishopric of Llandaff, as already noticed, but it is supposed Coverdale’s age and infirmities, and the remains of the plague, from which he had just recovered, made him decline so great a charge. In lieu of it, however, the bishop collated him to the rectory of St. Magnus, London Bridge; and here again the good man’s poverty presented an obstruction, as appears from some affecting letters he wrote to be excused from the first fruits, amounting to 60l. which he was utterly incapable of paying: one of these letters, in which he mentions his age, and the probability of not enjoying the preferment long, he concludes with these words:” If poor old Miles might be thus provided for, he should think this enough to be as good as a feast." His request being granted, he entered upon his charge, and preached about two years; but resigned it in 1566, a little before his death. He was very much admired by the puritans, who flocked to him in great numbers while he officiated at St. Magnus’s church, which he did without the habits, and when he had resigned it, for it does not appear that he was deprived of it, as Neal asserts, his followers were obliged | to send to his house on Saturdays, to know where they might hear him the next day, which he declined answering lest he should give offence to government. Yet, according to Strype, he had little to fear; for, Fox, Humphrey, Sampson, and others of the same way of thinking, were not only connived at, but allowed to hold preferments. 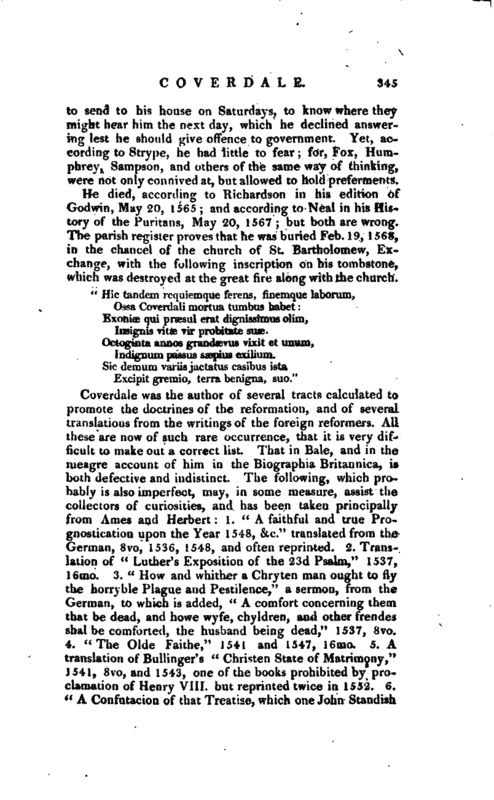 He died, according to Richardson in his edition of Godwin, May 20, 1565 and according to Neal in his History of the Puritans, May 20, 1567 but both are wrong. The parish register proves that he was buried Feb. 19, 1568, in the chancel of the church of St. Bartholomew, Exchange, with the following inscription on his tombstone, which was destroyed at the great fire along with the church. Excipit gremio, terra bemgna, suo." Bale and Tanner. —Strype’s Life of Cranmer, p. 59, 82, 138, 266, 271, 274,310,314, 444. —Strype’s Parker, p.G 7,54, 56 58,148, 241 3. —Strype’s Grindal, p. 27,91,95, 116. —Strype’s Memorials, vol. II. p. 90, 277,464; vol. 111. p. 152. —Strype’s Annals, vol. 1. p. 3i6; vol. II. Appendix, book I. No. 22. Clark’s Lives at the end of his Martyrology. 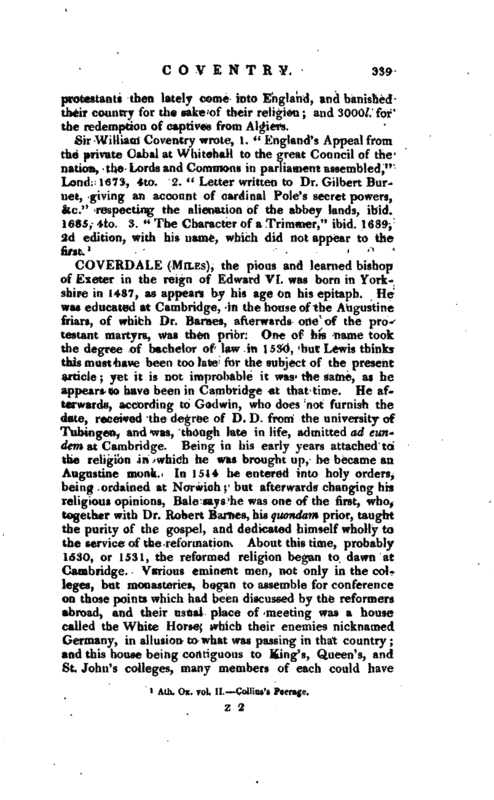 Polwhele’s Hist, of Devonshire. —Gent. Mag. vol. LXI. A ms. in the College of Arms, I. 15, F. 93, a part of which was communicated to the editors of the last edition of the Biog. Brit, and is the only article of the least consequence in that very imperfect accouut, which concludes with a gross misrepresentation by Neal, Lewis aud archbishop Newcombe’s Hist, of the Translations of the Bible.